KATHMANDU, March 13: Nepal has defeated Kenya by seven wickets at the ICC World Cricket League held at TU Cricket Ground on Monday. Chasing the target of 156 runs set by Kenya, Nepal reached the target in 30.2 overs at the cost of three wickets. Captain Gyanendrda Malla topscored with 64 runs studded with 8 fours and one six off 93 balls, Dipendra Singh Airee made 62 runs including 8 fours and 1 six off 66 balls while Sarad Vesawkar contributed 24 runs including 4 fours and one six and remained not out. For Kenya, E Otieno took 2 wickets conceding 21 runs while CO Obuya claimed 1 wicket giving away 22 runs. Earlier, sent in to bat first after losing the toss, Kenya set 156 runs target for Nepal in the second match. As Sharad Veswakar and Mehboob Alam bowled to a class, Nepal bowled Kenya all out at 155 runs in 46.1 overs. Mehboob Alam claimed two wickets. In his seven-over spell, Alam bowled five maiden overs and gave away only 11 runs. Likewise, part-time bowler Vesawkar claimed four wickets in the match. Bowling 7.1 overs, Vesawkar claimed four wickets giving away only 28 runs. He took the wickets of opener Irfan Karim, middle-order batsman Karan Kaul and tail-enders Ngoche and Otieno. Basant Regmi took two crucial wickets while Sandeep Lamichhane and Sagar Pun claimed a wicket each. Lamichhane claimed the wicket of Collins Obuya, who scored 48 runs off 78 balls for Kenya. Karim scored 38 runs off 77 balls while Captain Rakep Patel scored 21 runs off 33 balls. Kaul (14 runs off 43 balls) and Nehemiah Odhiambo (15 not out) were the other major contributors for the Kenya side. Nepal had lost the first match against Kenya by 5 wickets on Saturday. 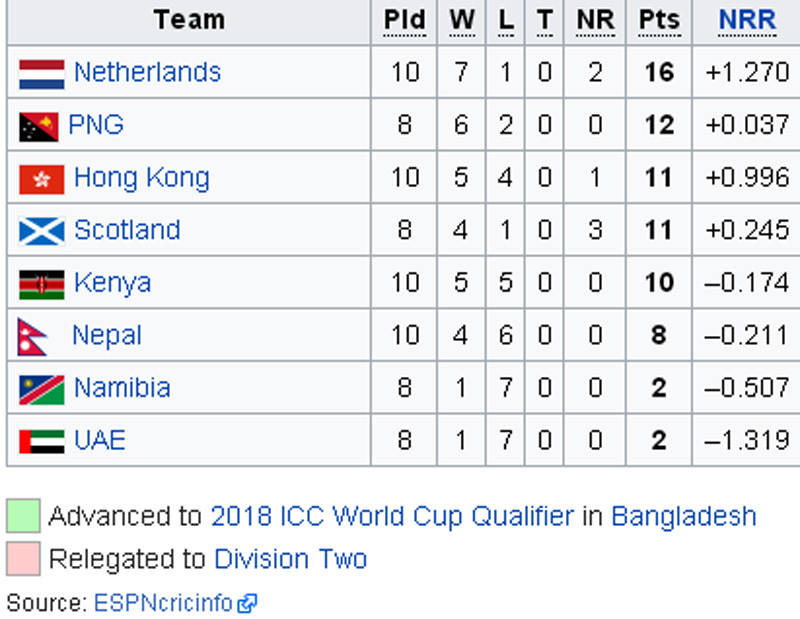 With this match, Nepal still keeps holds to appear in top four in the table. This is the last match for Nepal to play in the home ground. Nepal will now have to face Hong Kong and UAE between July to December.